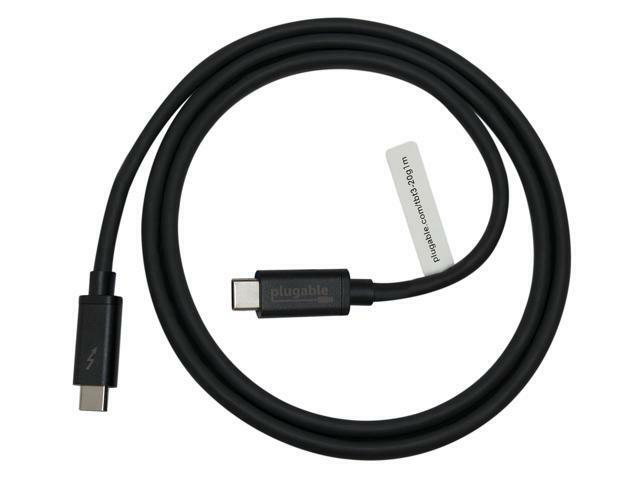 The Plugable TBT3-20G1M cable is first and foremost designed as a Thunderbolt 3 cable but it is also a universal USB-C cable for use with USB-C computers, phones, tablets, docking stations, accessories, and more. It supports all USB-C cable features, including USB 3.0 and USB 2.0 data lines, wire gauge supporting up to 3A charging via USB-IF Power Delivery standard (5V-20V, 60W max), and support for reporting its capabilities as an electronically marked cable. Because the cable is designed for Thunderbolt 3, it is also capable of supporting data transfer speeds twice as fast as standard USB-C cables. The available 20Gbps bandwidth allows for dual 1080P@60Hz video outputs (or a single 4K@60Hz output) and up to 3A/60W charging capabilities when used with compatible systems and Thunderbolt 3 accessories. One 3.3’/1m Thunderbolt 3 USB-C to USB-C cable.